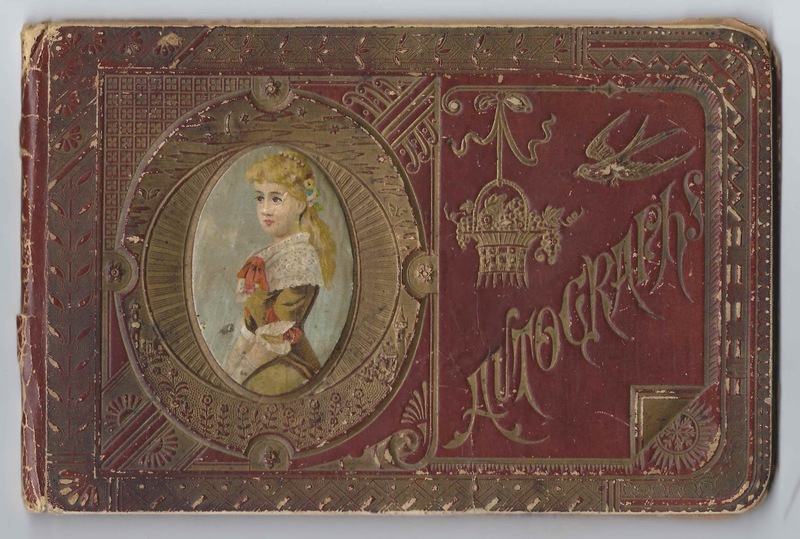 1880s/1890s autograph album of Oleta C. Loghry of Cameron, New York. 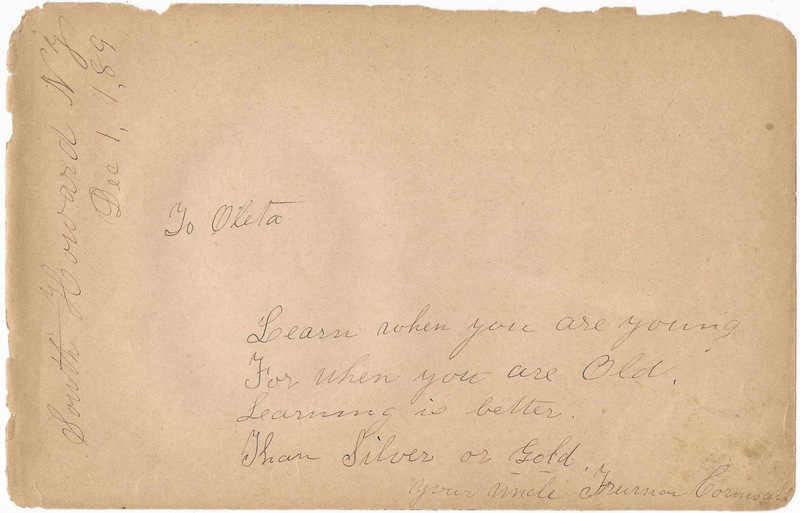 The album is approximately 9" x 6" and contains the sentiments of over twenty of Oleta's relatives and friends. Oleta C. Loghry was born about August 1879 in Steuben County, New York, the daughter of Abram and Almira (Ross, I think) Loghry. 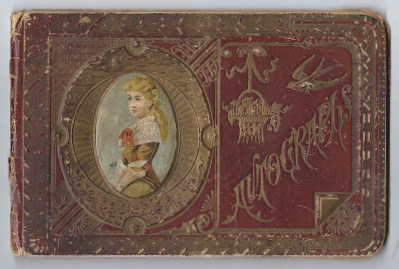 Several of her paternal relatives signed pages in her album. 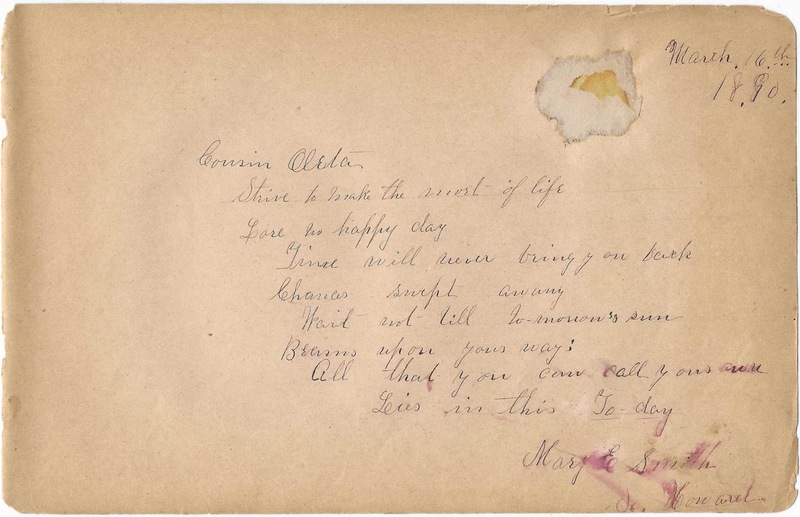 Aunt Rachel (Loghry) Smith, her husband Ira R. Smith and their two daughters, Mary E. Smith and Nettie L. Smith, signed pages in Oleta's album. Rachel (Loghry) Smith was a sister to Oleta's father Abram Smith. 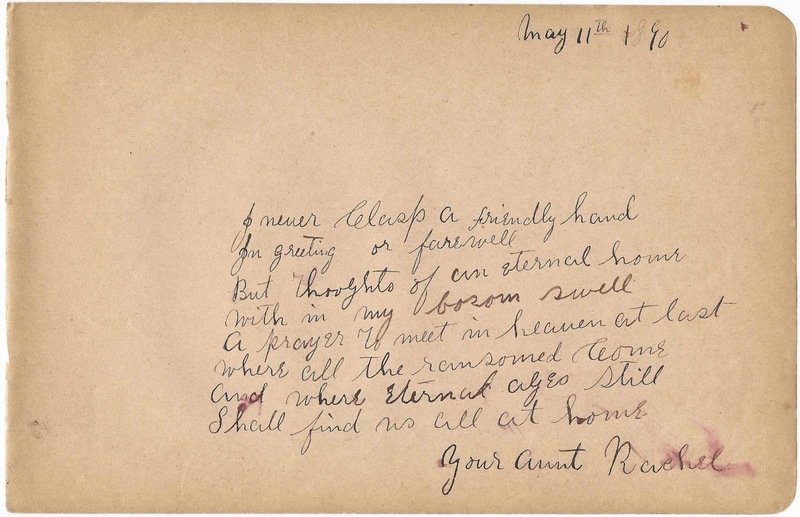 Aunt Rachel (Loghry) Smith signed her page on May 11, 1890. 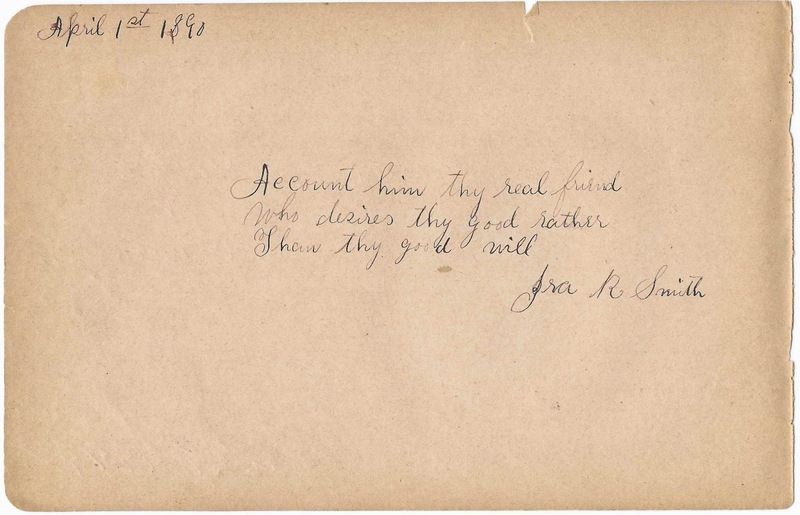 Rachel's husband, Ira R. Smith, signed a page on April 1, 1890. 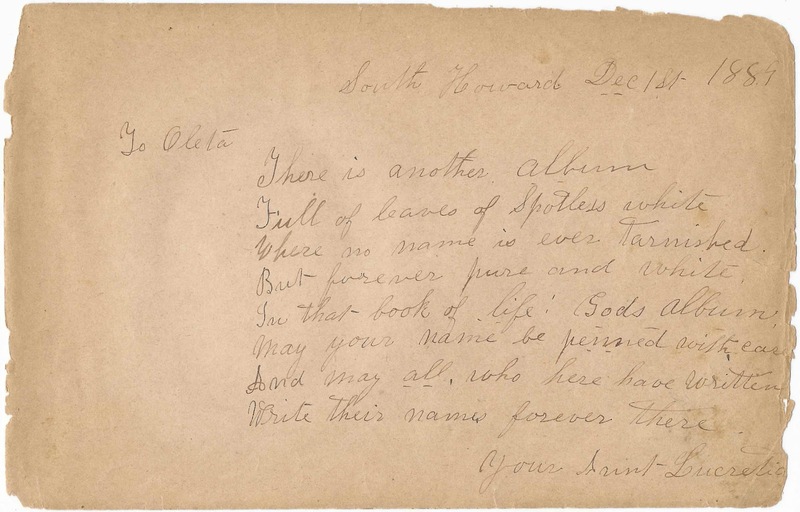 Their daughter Mary E. Smith signed a page on March 16, 1890 at South Howard, New York. 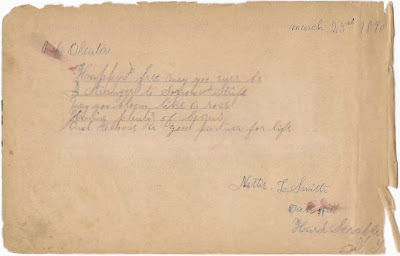 Daughter, Nettie L. Smith, signed a page on March 25, 1890, at Oak Hill, Hard Scrable [sic], New York. 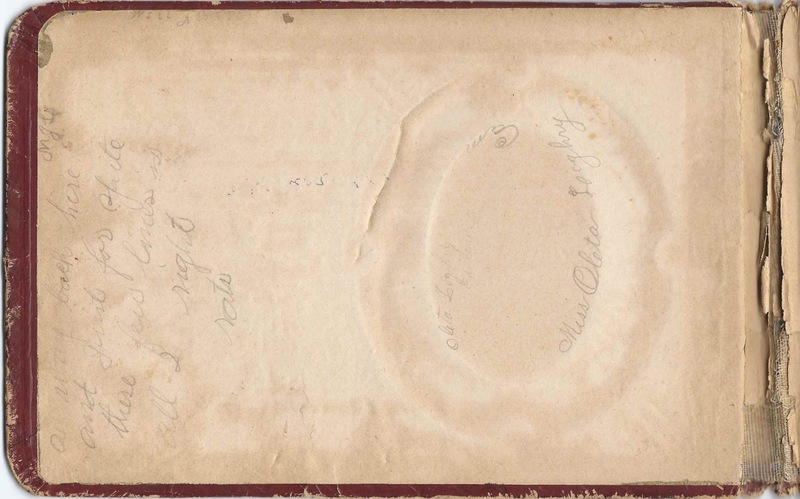 Another of Oleta's aunts, and members of her family, signed pages in her album. 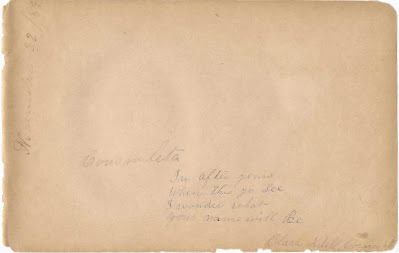 Aunt Lecretia (Loghry) Cornwall signed a page at South Howard, New York, on 1 December 1889. 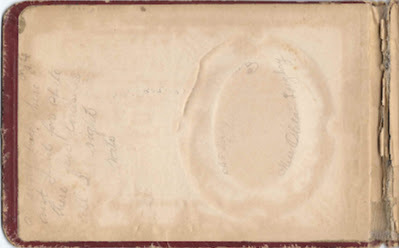 Lucretia's husband, Truman Cornwall, signed a page in December 1889, at South Howard, New York. 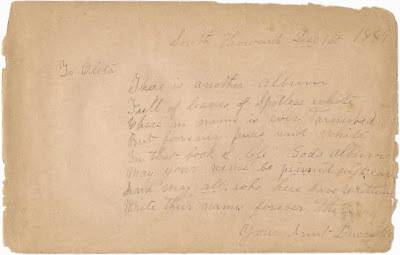 The daughter of Lucretia (Loghry) and Truman Cornwall, Clara Adell Cornwall, signed a page on November 22, 1889. 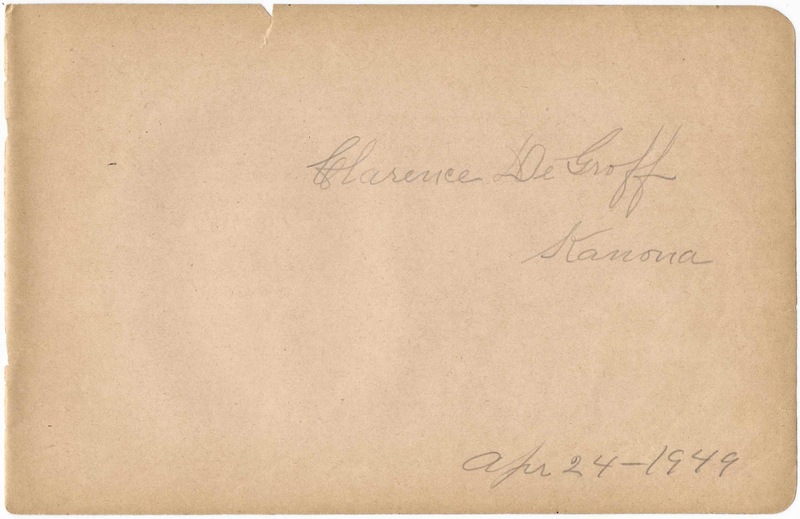 At some point after 1900, Oleta C. Loghry married Clarence DeGroff, son of A. Harrison and Mary (Strang) DeGroff. They had at least two children, daughters Lena Lenora DeGroff and Irma DeGroff. Clarence and Oleta operated a dairy farm at Hornellsville, New York. Later, they moved to Bath, New York, where Clarence worked for the railroad. 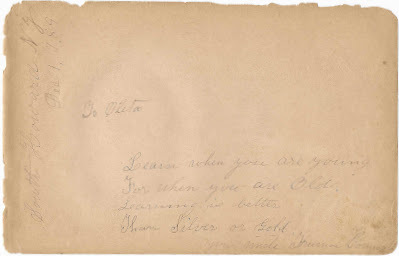 Apparently Oleta's album came to light years later, and her husband Clarence DeGroff signed it in 1949 at Kanona, New York. Oleta died in 1969. Mrs. Amanda Burch; she wrote upside down on the page. 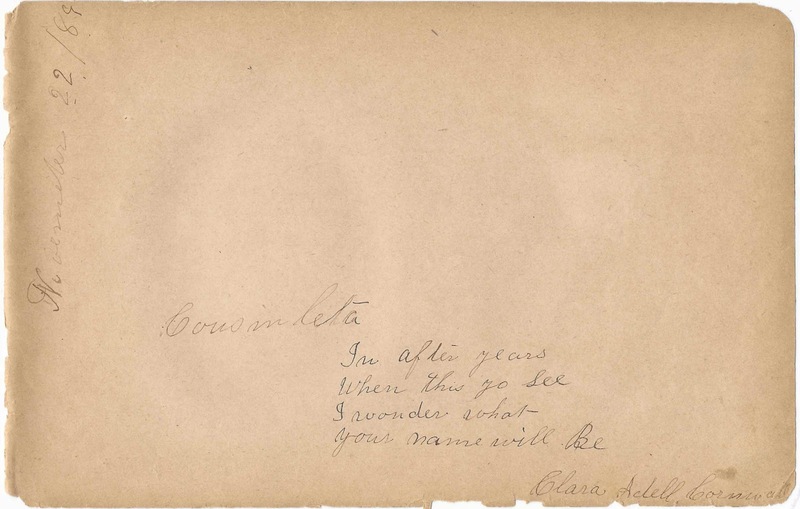 Cousin Clara Adell Cornwall, signed November 22, 1889. Daughter of signers Lucretia (Loghry) Cornwall and Truman Cornwall. Abigail Flewlin; middle initial P or I or ?. Possibly the Abigail Fluellyn/Fluellen listed on the 1890 Veterans Schedule at Cameron, New York. 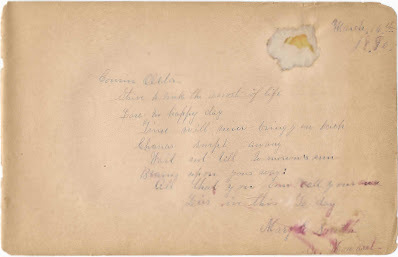 I believe she was the third wife of Edward B. Flewellen [variant spellings] He must have served in the Civil War as, though he himself had apparently died, Abigail is listed on the 1890 Veterans Census Schedules. 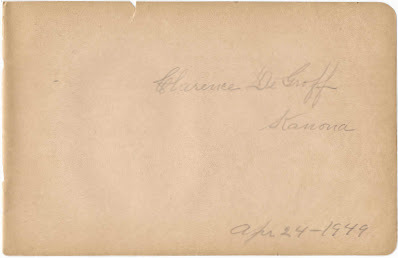 Cousin Mary E. Smith of South Howard, New York, signed March 16, 1890; daughter of signers Rachel (Loghry) Smith and Ira R. Smith and sister of signer Nettie L. Smith. 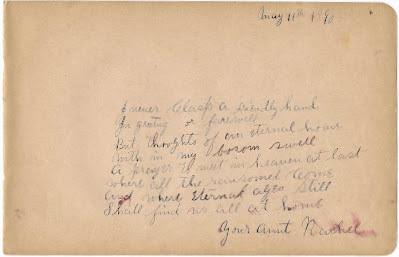 Rachel (Loghry) Smith was a sister to Oleta's father Abram Smith. 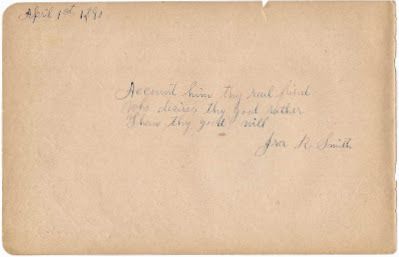 Ira R. Smith, signed on April 1, 1890; husband of signer Rachel (Loghry) Smith and father of signers Mary E. Smith and Nettie L. Smith. 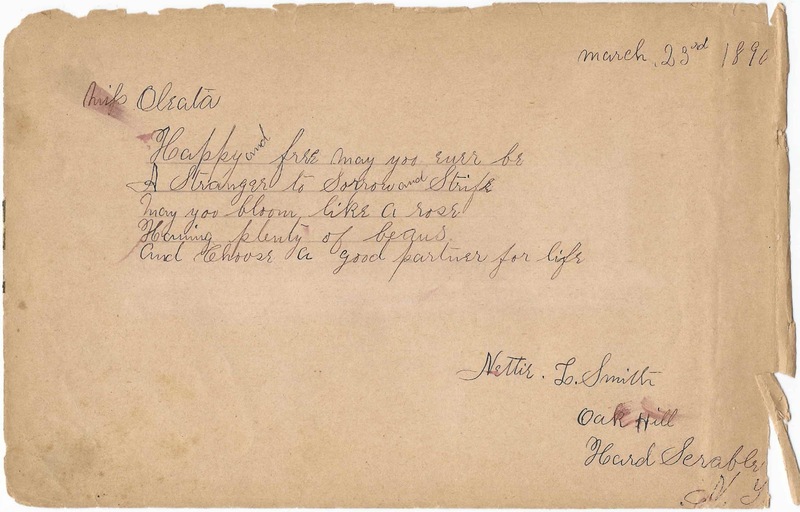 Rachel (Loghry) Smith was a sister to Oleta's father Abram Smith. Netttie L. Smith of Oak Hill, Hard Scrable, New York, signed on March 23, 1890. Oleta's cousin, Nettie L. Smith, daughter of signers Rachel (Loghry) Smith and Ira R. Smith and sister of signer Mary E. Smith. Rachel (Loghry) Smith was a sister to Oleta's father Abram Smith.